No More Page Refreshes: use jQuery! Here's an open apology to users of web sites I helped build: “Sorry I made you suffer through unnecessary page refreshes.” That's the first thing that popped into my head after learning about jQuery earlier this year. Split the search form and search results into 2 separate JSPs so the results can be displayed separately, without having to re-render the search form. Add a placeholder <div> on the search form JSP to hold the search results. Add a line of jQuery that submits the search form in the background using AJAX, placing the results in the placeholder <div>. 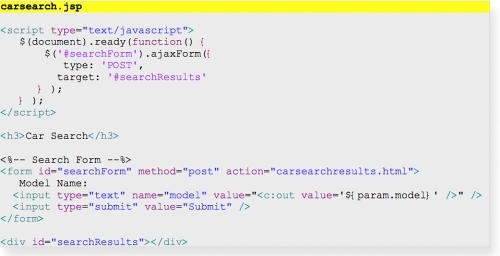 Lines of jQuery code start with “$()” and always select an element such as “document” or “#searchForm” to operate on. jQuery acts like a decorator and allows you add all kinds of interesting behavior to elements such as AJAX-enabling forms, visual effects, drag-and-drop, and more. The example shows a lot of functionality baked into a couple of lines of code, and demonstrates why I like jQuery: the decorator approach makes it ideal for enhancing existing web apps. Rather than rewriting existing HTML, you can apply jQuery to decorate it and add new behavior. In the first example, jQuery was used on the client, but nothing significant was changed on the server. We still kept the basic flow, which involved the user clicking on something in the browser, a server request being created, and HTML being returned. But what if the server can return data in the form of JSON or XML instead of HTML? In the optimized flow, three user interactions only generated one server request. Let's look at a code example where the server returns JSON data to the browser. Let's replace the original car model search page with a page that includes both a make and model drop-down. When the user selects make, the models for that make are populated. 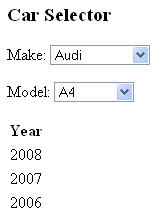 When the user selects a model, a table listing the available model years is populated. Line 13 – This ModelAndView is created using a simple JSON-rendering View class that I wrote called JsonView. Spring MVC makes is quite easy to write custom views, and JsonView is where XStream gets hooked in. Line 14 – A list of Models is added to the ModelAndView using a key that is expected by JsonView. It really is that easy. The XStream library also includes a set of annotations that you can place on your domain or transfer objects to provide hints on how to render the JSON, but in general the library works with minimal configuration. The “select[name^=make]” expression looks a lot like a CSS selector, and that's because jQuery selectors are a super set of CSS selectors (kind of like if CSS and Regex had a baby together). These expressions are very powerful, and can be used to select single or multiple items at a time. In this case, the expression reads, “Select a <select> element whose name attribute is 'make' and bind the loadModels function to the change event". Every time a user selects a value from the dropdown, the change event is generated by the browser, and the loadModels function will get invoked. Line 2 - The getJSON method will perform a AJAX request and expect JSON returned by the server. It requires 3 parameters: the request URL, any request parameters, and a callback function to invoke once the server responds. The code at line 6 reads, "For each model..."
Line 10 - Select the <select> element where name=model, and replace the option list with the options that were just constructed. update the options in a dropdown based on that JSON. That's powerful stuff, and one of the reasons I really like jQuery. Now what about caching? It is a trivial case to add an "if" statement prior to the getJSON call to see if the result already exists in cache. There is a nice little jQuery plugin called jCache that you can use. jQuery + Spring MVC + XStream/Jettison provides a really nice stack to rapidly develop web applications that cleanly separate data and presentation, provide the user with a better experience, and potentially improve performance along the way. Are there other high-quailty frameworks that can help you do this? Sure, but I like the combination of jQuery, Spring MVC and XStream/Jettison, and I feel each are "best-of-breed" in their particular niches. YOu can download the full example code HERE. Since his first Java assignment, printing reports with Java 1.02, Joel Confino has been hooked on Java technology. He has been working on distributed systems, various web architectures, and JEE design and programming for the past 10 years. 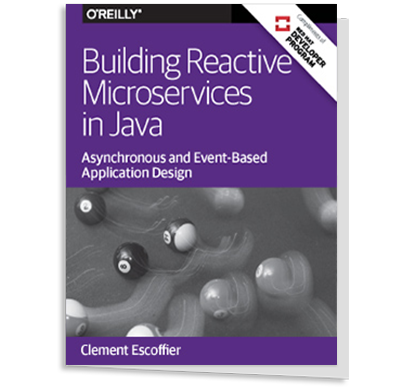 Confino has consulted at many large financial services and pharmaceutical companies, and helped them use Java to expand their business and reach their customers with sophisticated web-based systems. He is currently a Java architect at Chariot Solutions. How does this compare to the Ajax support that is in Spring MVC? Re: How does this compare to the Ajax support that is in Spring MVC? How would you describe your jQuery option compared to that default functionality? The Spring MVC JS support that you're talking about is based off of Spring 2.5+. I built something similar to Joel's framework. I've also looked into the Spring-JS stuff that's in the Spring Web Flow package. Basically, Spring-JS is an integration between Spring MVC and Tiles that only renders a partial HTML fragment rather than the whole page. The JS/Dojo portion calls the original controller and tells it which parts to render, and then how to place that HTML fragment back into the current page. Spring-JS is not in the Spring core package, and has to be downloaded as part of the Spring Web Flow package. Joel's approach uses JSon rather than HTML fragments. It also uses JQuery's built in DOM manipulation. It's more network friendly, but you may end up with more cross-browser issues, since you're doing a lot of DOM manipulation. JQuery handles a lot of issues, but not everything. JQuery seems to be a favorite of UI developers who are more comfortable in JS. Dojo seems to be a favorite of the Java/back-end guys. What if user looses his/her session and then tries to use the system. How would you handle such situation? Is there any built-in solution in JQuery to handle that? Thanks Solomon for the good summary of Spring JS. I am new to Spring JS myself (2.0 was just released in April), but I agree with your assessment. So how do jQuery and Spring JS compare? I think they overlap. jQuery is more flexible and general purpose, but Spring JS looks promising and provides some features that jQuery doesn't (more on that below). I personally like the server returning data instead of HTML, and to do that you'll need a framework like jQuery or Flex or GWT on the front end. A major advantage of that architecture is that the UI and server are completely decoupled. The XML/JSON document becomes the contract between them, and often the server implements a REST-based API. This allows them to be developed on different schedules independently. So UI folks can immediately develop the UI using a static XML file for data and don't have to wait for the server to be developed. Likewise the server can be developed and tested without needing the UI. Just to expand your question a little bit, I'll rephrase it as, "What happens when you make an AJAX call and you are not authenticated with the server?" In my experience there is no built-in standard solution in jQuery to handle authentication. However the custom solution is not too difficult. After making an AJAX call, you check the server response in a callback function. If the response from the server is "Hey you're not authenticated" you show the user a login dialog or something, and send the username/password to the server in another AJAX call. It is actually quite common to need to do some custom stuff before and after AJAX calls (like checking the response for something after a call or checking a local cache before making a request), and jQuery is extensible and makes it easy to make your own custom functions and have them be available in the jQuery "$." namespace. So instead of calling jQuery's $.getJSON function you call your custom $.getJSONCustom function which does additional work and delegates to jQuery's $.getJSON for the actual AJAX call. Might be bit of a stupid question here, but will this work with Hibernate 3+? I am looking at a jquery/jsonview/spring/hibernate/mysql stack hence the question. We tried to use JSONView from another project and apparently there were some conflicts. What is your take on this architecture? I would much appreciate if you throw some light on this. 1. 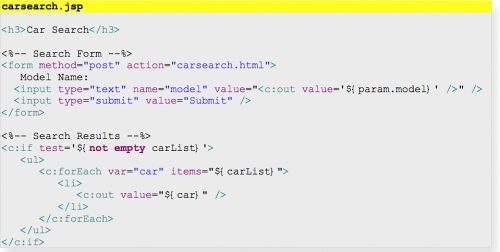 I understand that the demo carsearchresults.html is ajax with out JSON. Correct? 2. I tried to the same as the carsearchresults.html example in my code. The action took place, it returned to the url with carsearch.html page but showning only the context of carsearchresults.html. Do you have an idea what I have to do? The only different in my code is that I am using a formcontroller. hello, could you please update the download link? I'm really interested in the example code.